Four students examine the untold legacy of women, veterans, international students and staff of GW. 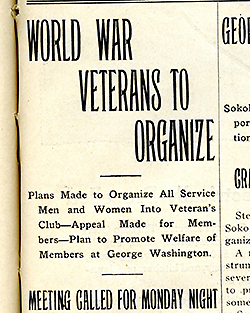 While the history of the George Washington University began with a group of 11 students in 1821, it has expanded over nearly 200-years to build a legacy that includes soldiers on the frontlines of the two world wars, staff who have served for more than 40 years, women who have fought for rights alongside suffragettes and international students from around the globe who made GW their home. The inaugural cohort of University Archives Diversity Research Fellows—students Eden Orelove, Isabel Garcia, Tasha Dorsey and Dominic Amaral—spent an academic year combing through the University Archives at the GW Libraries to dig up these unsung stories, examining the lives of the nonacademic staff, women, international students and veterans who have contributed to GW’s history. Mr. Jules and Public Services and Outreach Librarian for Special Collections Jennifer Kinniff managed the program and offered guidance to the students about navigating the GW Libraries’ collections and finding sources beyond the archives. “This program is a great opportunity for students, especially undergraduates, to do this kind of research and be really well supported by faculty and staff,” Ms. Kinniff said. For Ms. Dorsey, a graduate student in the Columbian College of Arts and Sciences' clinical psychology program, friendships she formed with the cafeteria staff an undergraduate at the United States Naval Academy inspired her interest in researching the lives of staff members at GW. A veteran, Mr. Amaral, B.A. ’14, applied for the program at the urging of Michael Ruybal, associate director of the Office of Military and Veteran Student Services. Mr. Amaral scoured 50 years of veterans’ history at GW, beginning with 1900. He was fascinated by the university’s flexibility at the onset of World War I, when GW developed courses focused on firearms, camouflage and ship hull engineering to better educate the changing student body. By the end of WWI there were 1,200 veterans out of 3,200 students, he said. “Not much has changed since 1944, and this project stands as an example to other veterans to remind us that we are not the first or the last to serve,” he added. "I enjoyed reading and compiling this history because it’s very similar to modern day,” he said. Ms. Orelove conducted an in-depth study of women at GW and found that the Columbian Women organization has been a champion for female students for 125 years. She said that researching the place of women at GW in history was an important experience, from discovering the stories of alumni pioneers such as Antarctic explorer Jackie Ronne and aviator Jacqueline Cochran to learning about the Columbian Women’s contribution to purchase a gram of radium for scientist Marie Curie. The research project was also personal for rising senior and Isabel Maria Garcia, a native of Ecuador, who studied the emergence of international students at GW. She said that the development of the English as a Foreign Language program, founded in the 1970s to serve international students, was a turning point for the international community on campus. By the mid-1970s there were 1,229 foreign students from 101 countries attending GW. 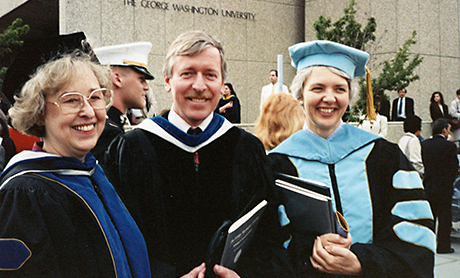 A faculty member stands with Associate Professor Emeritus of English George Bozzini (middle) and Associate Professor Emeritus of English as a Foreign Language Christine Meloni (right), professors in the English as a Foreign Language Department. The fellows each wrote a research paper in consultation with a faculty adviser and presented their findings at the end of the academic year. Mr. Jules said that the students’ projects will be a valuable resource for future researchers. Next year’s program is in the planning stages. Updates on the application process will be posted online.